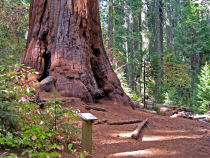 Why visit the Merced Grove? It's the smallest of Yosemite's three Giant Sequoia groves, with only about twenty of these venerable creatures, but it's also the least crowded. Like the Tuolumne Grove, it's downhill all the way to the grove. Difficulty: It's a smooth, wide trail (part of it is a former road), and it's not a very long hike. You will have to climb about 600 feet (180 meters) on the way back, though. It rates a 4 out of 10, somewhere on the slippery boundary between easy and medium. Best time to visit: The trees are fabulous any time there's daylight. You may get some bonus wildflowers in the spring. You should find big clusters of Western Azalea, one of Yosemite's most spectacular flowers, just past the last group of sequoias. Crowd Factor: The sequoias no longer exhibit surprise at the presence of humans in their midst, regardless of how carefully you sneak up on them. Nonetheless, the Merced Grove is nowhere near so crowded as the lower Mariposa Grove. Nearest Snacks: at Crane Flat, 3.8 miles (6 km) south. If you did bring food, there are picnic tables at the trailhead, a rarity for Yosemite's trails. 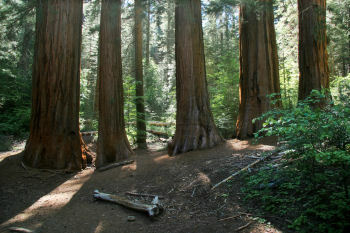 Driving Directions: The Merced Grove trailhead is off highway 120 north of Yosemite Valley. From the valley, take 120 north 13.5 miles (21 km) to the well-marked trailhead, which will be on your left. Here's a Google Street View panorama of the trailhead parking area. Trail Notes: A little under halfway to the grove, you'll reach a fork in the trail. Turn left to proceed downhill to the grove. The intersection is clearly signed, and you'll have no problem figuring out which way to go. Hazards: Like just about anywhere else in Yosemite, be prepared for mosquitoes.